Interior in need of a modern makeover? The answer is clear, well sometimes! Are you fed up with sanding, staining and varnishing your wooden shelves? Have you chosen the modern alternative and gone for the coated wood effect floating shelf, only to have the veneer chip or peel some after they were hung? If the answer to these questions is yes, you should read on. Just because we are called Splashbacks of Distinction, it doesn't means we only manufacture, supply and fit kitchen and bathroom splashbacks. We provide a range of glass products and services to our rapidly expanding client base. A good deal of enquiries we have recently recieved have been for toughened glass shelves. Why choose toughened glass shelves? To be honest, the main reason most of our clients opt for toughened glass shelves is because they just look so good. It's not until they have had them installed for some time that they really start to appreciate the other benefits of glass over wooden shelves. The ongoing maintenance required to keep wooden shelves looking good is rather time consuming and costly. 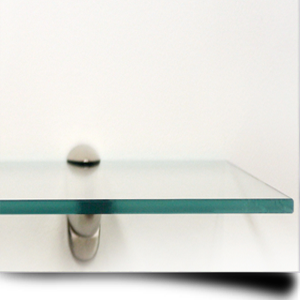 A toughened glass shelf is maintenance free! Apart from the odd dust or wipe, you will never need to do anything to keep it looking good. Should you damage a traditional wooden shelf surface, you will need to strip all the old paint off, sand it smooth, stain it your chosen colour and then varnish or wax the wood. If after all this you aren't happy with the finish, you could always start again! Better still, call us and choose a toughened glass shelf instead. Glass shelves are so easy to keep clean, a quick dust or wipe with a microfibre cloth and you're good to go. No more permanent coffee cup rings left on your shelving system! Toughened glass shelves are scratch resistant too, which is just as well as many ornaments have roughly finished bases that would scratch wooden shelves. Glass shelves are superior when it comes to showing off a collection of interesting ornaments. A fossil collection will look amazing on a well laid out glass shelving system. Should you have a mirror behind the shelves and some strategically placed spotlights, you will be able to view the fossils from all angles, making the most of their most interesting features. Perhaps the best reason to choose a bespoke toughened glass shelf is that we make them to your exact specification. There is no way you are going to find the exact size of glass shelf you want down your local DIY store. Splashbacks of Distinction are happy to measure up for you and provide you with a no obligation quote, so what have you got to lose? Clear, textured, coloured or frosted glass shelves: The choice is yours! This really is where our bespoke glass shelf service comes into its own. A clear glass shelf is understated but clean and impressive at the same time. A textured finish to a shelf can be quite spectacular in it's own right and a coloured glass shelf when lit will sparkle beautifully. If you don't want to see the underside of your ornaments or books, a frosted or sandblasted finish may be the right choice for you. Whatever you decide, the choice really is yours and we guarantee you'll love it! Why not check out our 'Buy Online' section to see the amazing range of colour options available to you. Your toughened glass shelves don't have to be clear! Once you've had a look at the bewildering array of colours that are available, the only problem you will have will be deciding which one to go for. If it all gets a little too much, why not ask us for some recommendations, a lot of clients do and we're always happy to help.